On Tuesday night the general store at Delora, operated by P.J. Gillen & Son was totally destroyed by fire. The origin of the fire is unknown. Click on the photo above for an excerpt (chapter 4) from "Chasing the Comet", the stories of David Caldow, a Scottish immigrant in Canada, written by biographer, Patricia Koretchuk. 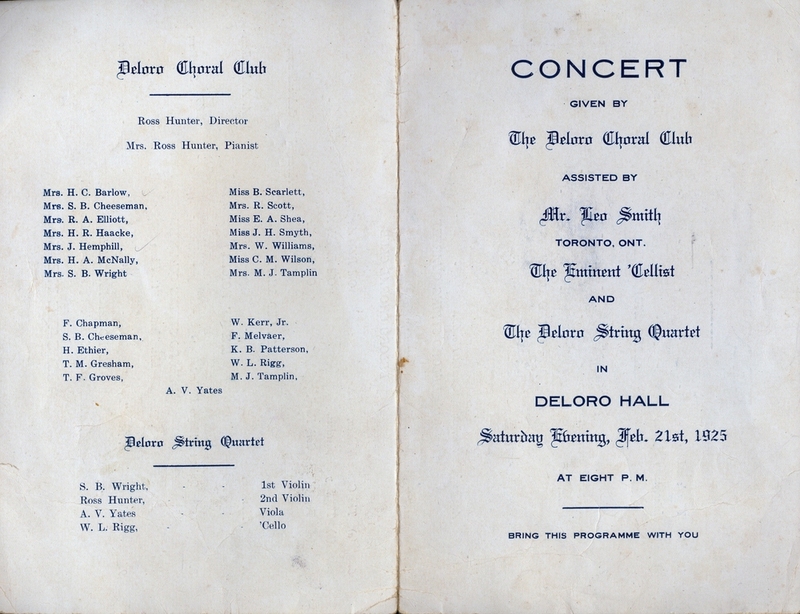 April 16, 1909 - "The new Deloro Orchestra made its first appearance at the dance which was held in the Deloro Hall. " In 1868 gold was discovered in Deloro at the site of the first Gatling Gold Mines. When a method for refining silver ore was discovered, Deloro Smelting and Refining Company built one of the first Canadian silver smelters and was produced at a cost of eight million dollars. This company produced arsenic, silver bullion, cobalt oxide, cobalt metal and nickel oxide and provided work for approximately 400 in and around Deloro. Industry restarted in 1907 and in 1914 Deloro was producing the first commercial cobalt in the world. Cobalt is necessary for high temperature alloys used in jet plane turbines. Between 8,000 and 9,000 tonnes a year are needed and Deloro's output helped keep quite a few of the world's newest aircraft flying. 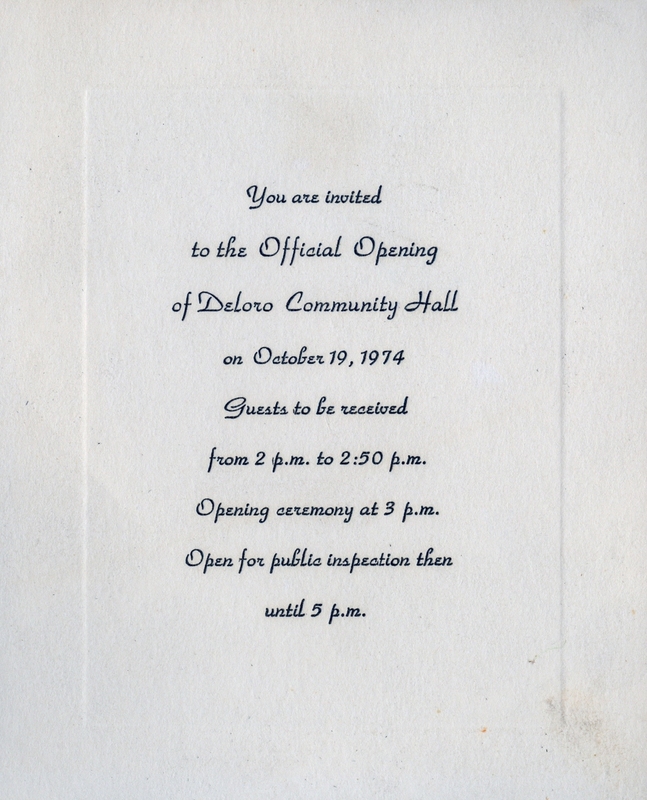 In 1955, the Deloro Stellite Department moved to Belleville, Ontario and in 1961, the remainder of the operation at Deloro ceased. 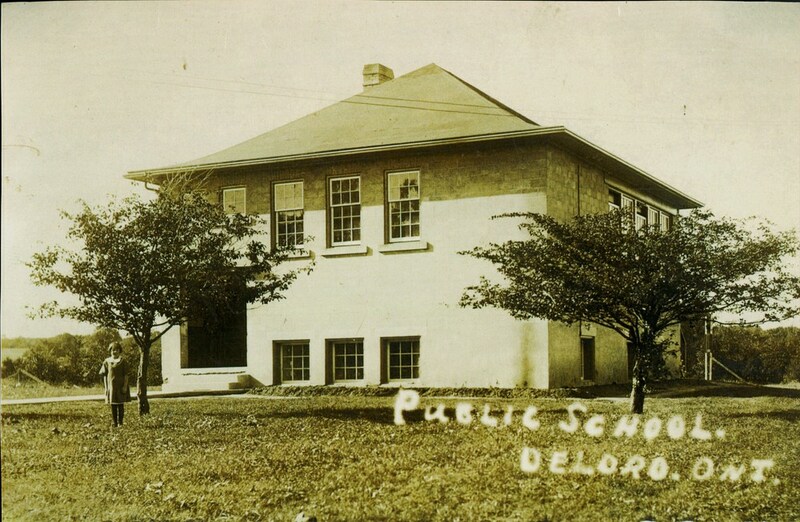 In 1919, the Ontario Legislature passed a special Act making Deloro the smallest incorporated village in Canada, with a population of approximately 250, including the elected Reeve. Discussions at Council Meetings were not usually about money but about a water main from a town well and sewerage, which Deloro, unlike many towns its size, does enjoy. Discussions would also centre on entertainment and recreational activities for the employees and their families. The Village of Deloro, a company-village, is a 19th century romance and flourished in the mid-20th century. The Deloro Mining and Reduction Co. owned the land, and all the gaily painted frame houses, together with the factory and office buildings. The Marmora Herald, in 1916, reports that Curran & Clement con-tractors, were awarded a contract for the erection of 12 houses in Deloro, including the installation of a waterworks system. It seems this was an early contract for this company that was to grow to become one of Ontario's biggest roadbuilders, involved with Highways 400 and 401. The workers lived in these houses and paid an average of $8.00 a month for rent, with all the repairs and maintenance taken care of by the company. In its earlier times Deloro hosted its share of newcomers or refugees from Yugoslavia, Hungarian and Poland, which added to its old pioneers of the last two centuries keeping the "help-your-neighbour" atmosphere happy. 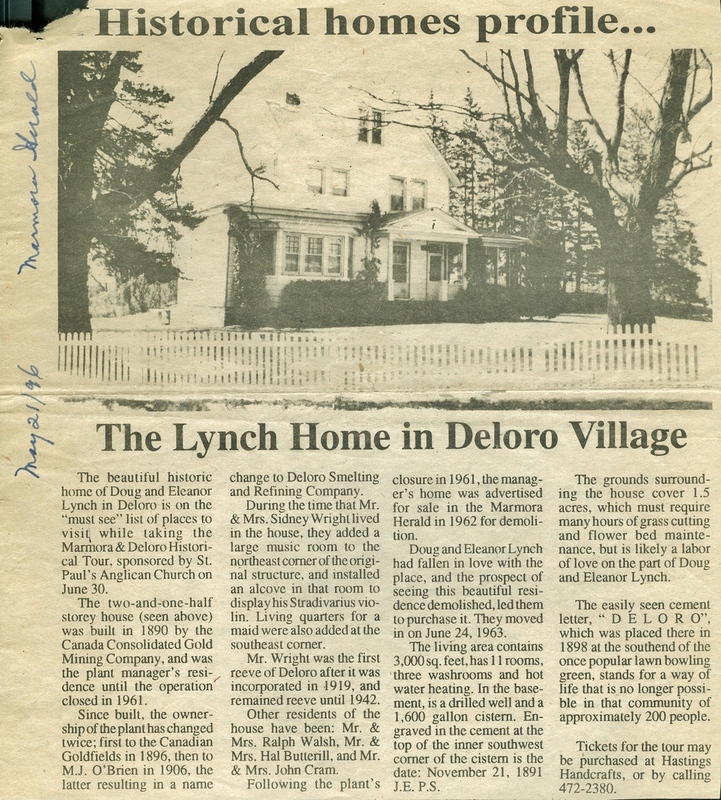 In 1919, due to the importance of the Village, a special act of the Ontario Legislature proclaimed Deloro as the smallest incorporated village in the Province of Ontario. The population was 200. The company executives become the Village Council. 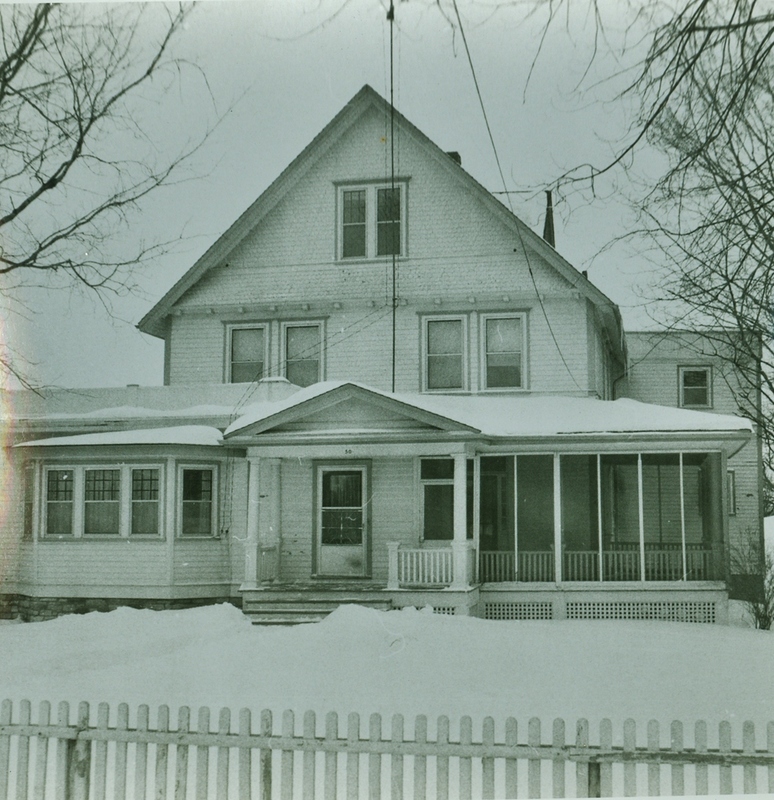 The village had a general store, public library, community hall, two retirement homes and a boarding home, a public school, a Roman Catholic school, and among the recreational facilities were a lawn bowling club, an outdoor skating and hockey rink complete with lights for nighttime activities, two changing rooms complete with wood stoves, a lightedski and toboggan hill, a baseball diamond, a football field on which many other activitiestook place. The Town Hall hosted movies, Christmas Eve pageants, dances for teenagers, and dances for adults on New Year's Eve, a Bean Supper in the fall, a Remembrance Day Service every November and a very well-used Library. At the T-road corner stood a big white house called The Company House, Deloro's only hotel. Down the small street to The Company House were two apartment buildings, and across the street from the apartment buildings was a grand old house which housed the present acting manager of the plant. Also across the street from The Company House was a large building bearing the legend Deloro Trading Company again located on company property. Everything was sold from these premises, from pins to pomegranates. 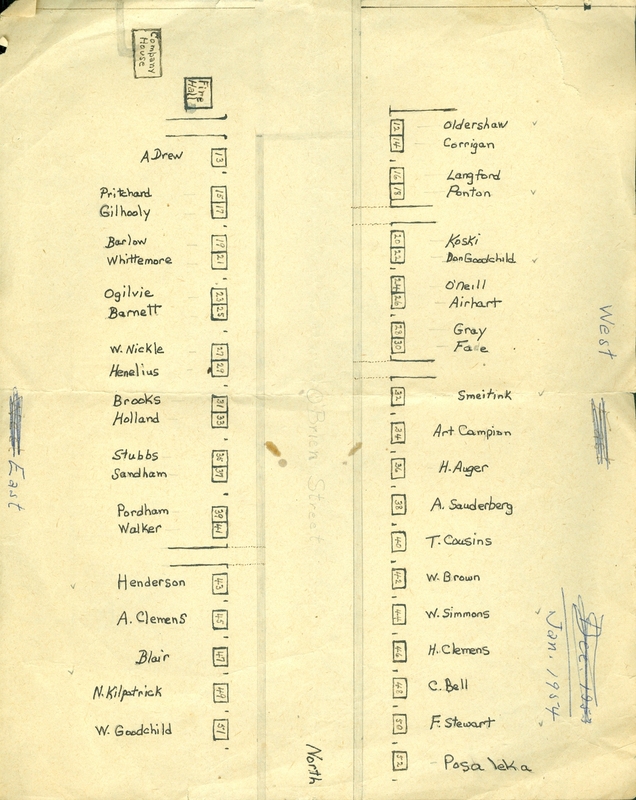 Postal boxes were located here with the postmaster being employed at the plant. There was also a two-pump gasoline station, a community hall and across the street were two rather large houses housing management for the plant. There were two advantages to everything being owned by the Village. There were no taxes for the residents and the company paid for all, and secondly there was no crime , no jailand nopoliceman, except for the specially appointed ones on Halloween when young spirits would bubble over with the soaping of windows, upsetting of outhouses, gates and flagpoles. There were, of course, two schools in Deloro, one a public school and the other the Catholic school. Older students would take the bus to school either in Marmora or Madoc . There was no church or cemetery in Deloro, most people traveling to Marmora for worship. In the Community Hall, there was a Sunday Schoolfor the children anda Recreational Associationhostedsocial activities and athletics in the summer months there. Swimming took placeat " the Old Watering Hole." October, 5, 1911 - "The stage to and from Deloro is now being run by Mr. E. Loveless instead of Mr. J.S. Webb, who has run it for some years." 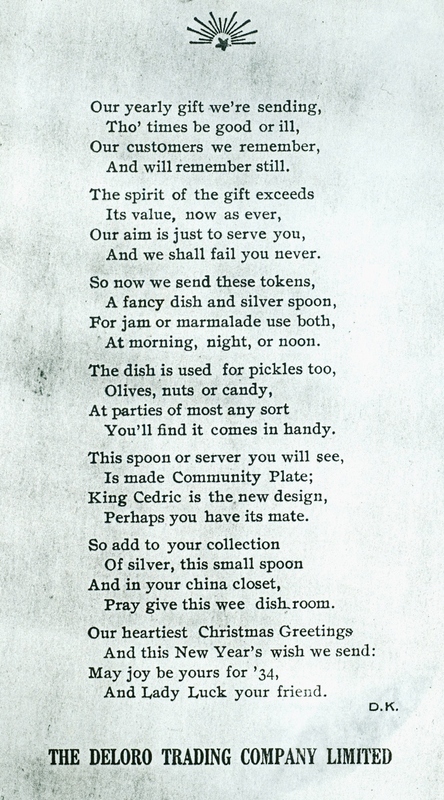 Feb 27, 1919 "The store of the Deloro Trading Co. is now open at Deloro." "Peter Kirkegaard is building a new residence in Deloro, directly opposite the tennis court. He expects to be in it by Christmas." 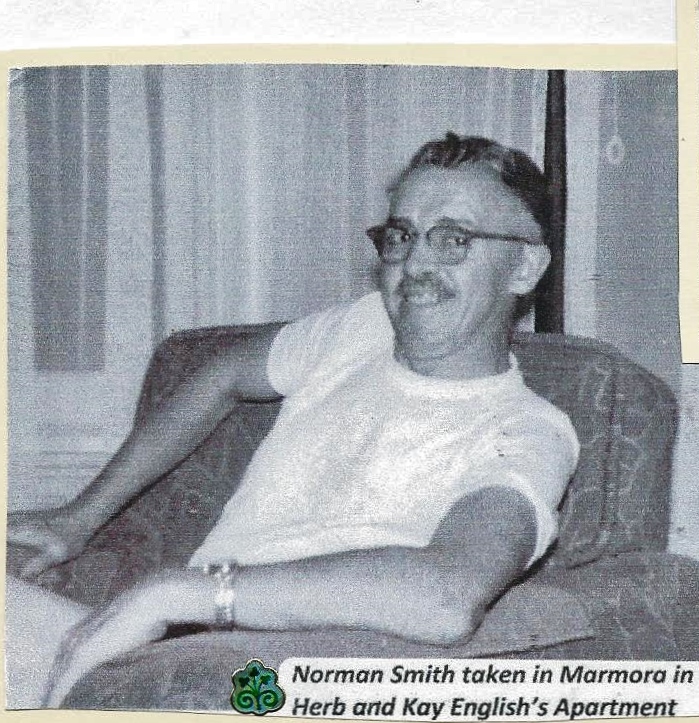 Peter Kirekgaard lived in Deloro with his second wife, Gytta Petra Frellson , his first wife, Johanne, having died in New Mexico, where he owned half a silver mine, previous to moving to Deloro. He had a son, Carl, and his two daughters, Grace and Guytha (who died at age 10). 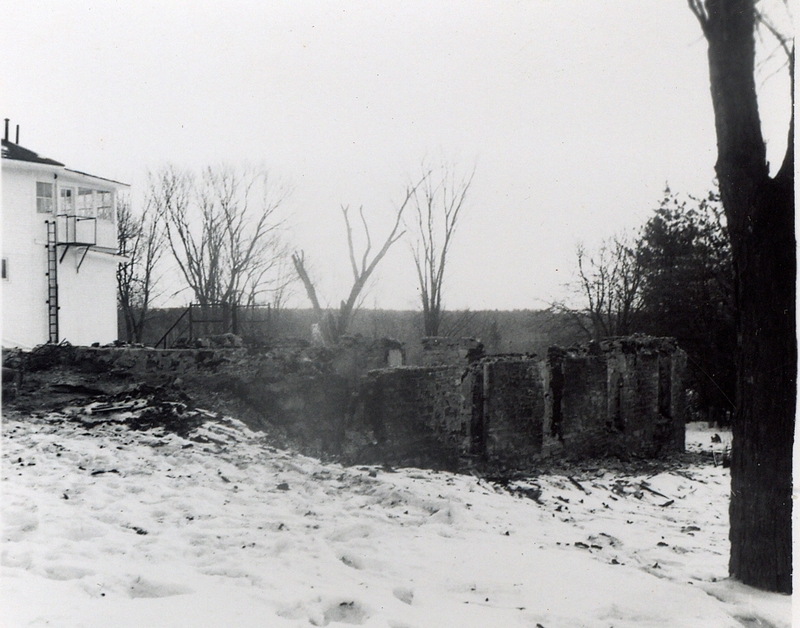 FEB. 2, 1911, A house belonging to Mr. James Auger was destroyed by fire. 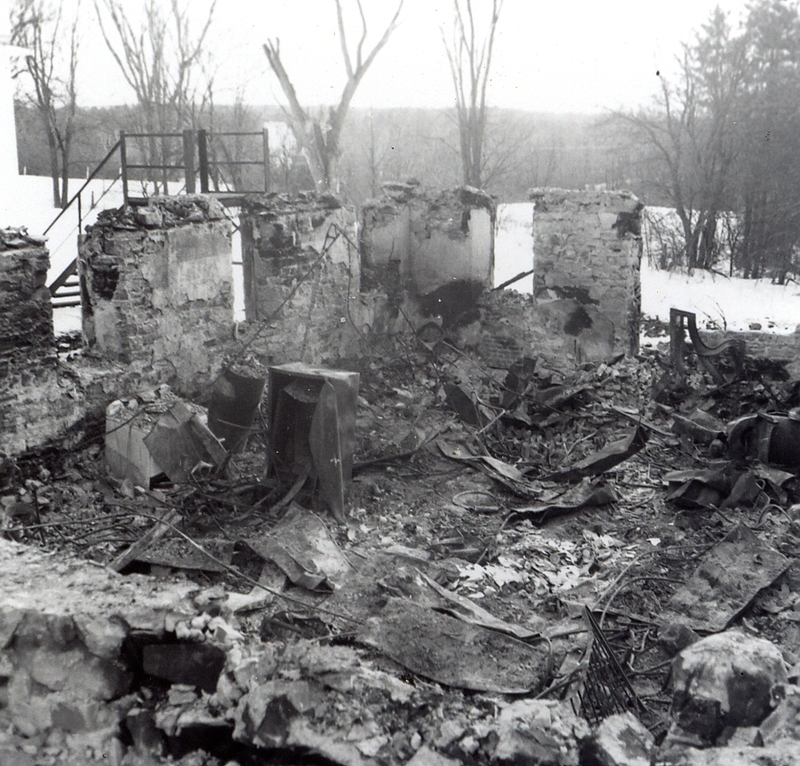 It was occupied by Mr. E. Vilneff, and the family were all in bed when the blaze started. The fire was first noticed by a man driving by about 2:00 a.m., who gave the alarm. Pet crows, Amos and Andy, cared for by Alphonse Clemens, before they were fledglings, have come into quite an amount of publicity recently owing to an episode which occurred at the residence of Jules Ethier. On Saturday evening, Jules placed a dollar bill and two dimes in a milk bottle at his back door to pay for milk tickets. When Thomas Hannah arrived next morning, there was the empty bottle but no cash so he rapped at the door to report this. The amazed Jules eventually found a dime on the veranda and another on the ground below, but no sign could be seen of the dollar bill. The next morning, when going to his garage to feed some chickens he saw the two crows, but thought nothing of it until a few minutes later they had come closer to the house. The detective element in Jules' mind then was roused. So he went indoors and placed a piece of paper the size of a dollar bill within the neck of an empty bottle and took the bottle to the spot where it was generally placed. He addressed the crows thus "Bring back that dollar to me or else." Incredible as it may seem, when he came out of the house a little later, there was the dollar bill. One of the crows presumably Amos, had made restitution. There was always a festive celebration on July 1 each year including baseball games, three-legged races, spoon races, etc., topped off by free drinks and ice cream supplied by the village. Fireworks were enjoyed in the evening. In the early months of winter each year the Sunday School was treated to a tobogganing party, with a dinner of scalloped potatoes, baked beans, and hot cocoa provided at the Community Hall. At Christmas there was a pageant given by the school childrenwitha huge Christmas tree in the centre of the Hall, topped off by a visit from Santa Claus with a gift and bag of goodies, again supplied by the Village. The Boy Scout Association of Deloro was organized in January of 1927, by Messrs S.B. Wright, F.A. Bapty, R.A. Elliott, W.R. Reynolds, R. Hunter, F. Paquet, F. Craig, M.J. Tamplin, W. Simmons, H. Loveless, W. Kerr jr., H.J. Berry and S.B. Cheeseman. Cheeseman was the Scoutmaster. Numerous opportunities to play all sports and in winter, a ski hill with lights was provided forus. Add to that, sledding, the outdoor skating rink and hockey. The outdoor rink was usually maintained by George Brooks and his sons with help from other members of the community. Rink carnivals with music were held, and prizes awarded in all categories. There were two changing sheds complete with wood stoves for warmth. On Remembrance Day each year, a service would be provided at the Community Hall with the laying of wreaths in memory of the war dead and those who were injured in the fighting. Documentary movies were shown to the children to helpthem understand.The first placing of wreaths at the Memorial Tablet in Deloro Hall took place, on November 11, 1949, with the Past Post and Reveille played by George Brooks and at other times by Tom Brooks. March 18, 1909 - The four-year-old son of Patrick Doyle, Deloro, was very badly burned when his clothing caught fire in the upstairs of his home. Mrs. Doyle carried him down, and was badly burned herself in the arms and hands, and in attempting to smother the flames, Mr. Doyle hands were badly burned but he was able to extinguish the flames in time to save the lad's life. Dr. Jones was called to the scene, as was a nurse from Peterborough. of Deloro when word was received that David was off the critical list and had been moved to the pediatrics section ofthe Hotel Dieu Hospital. Deloro Council... Alphonse Clemens , Len Bicknell, Doug Lynch , Ray Brown, Charlie Gordiner, Bernice Young.